love your tutorial. I totally figured it would be the same steam method I use, but I cannot wait to use yours! Thank you! I have such a hard time with hard boiling eggs. They are always either underdone or overdone or the shells never want to come off. Your method looks perfect and I cannot wait to try it! thanks for this! i just messed up my hard boiled eggs for the first time! no idea what happened but i will use your method going forward. good tips! 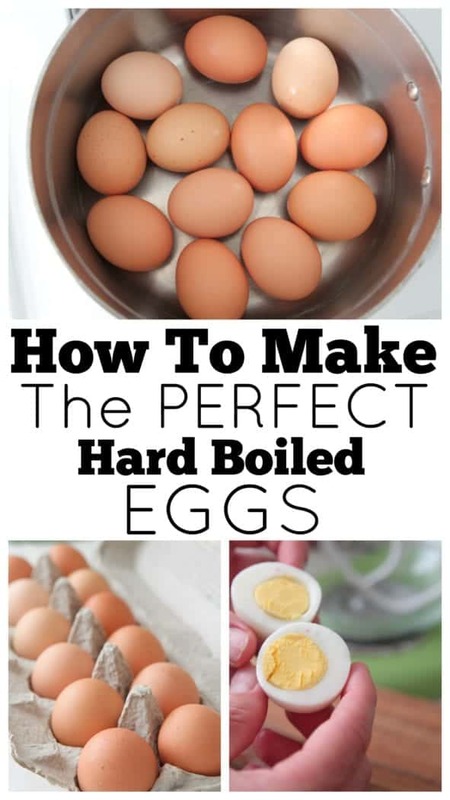 It seems so easy but I have had problems boiling eggs before! Thanks for the tips! Thank you! 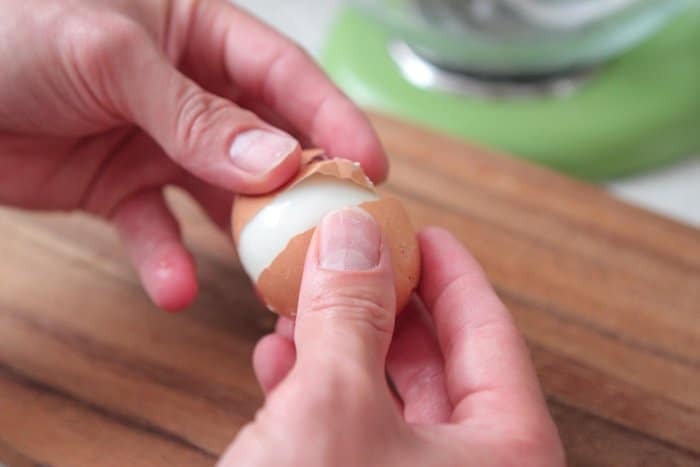 I rarely get a perfectly peeled egg- this is full of great tips! Thomas would love this step by step! Perfect for those boys who are trying to eat more protein! I do a variation of this, and works like a charm! Perfect for having on hand for quick breakfasts! Such a handy post! Bookmarked! I have my own chickens and sometimes I boil eggs a day after collecting. 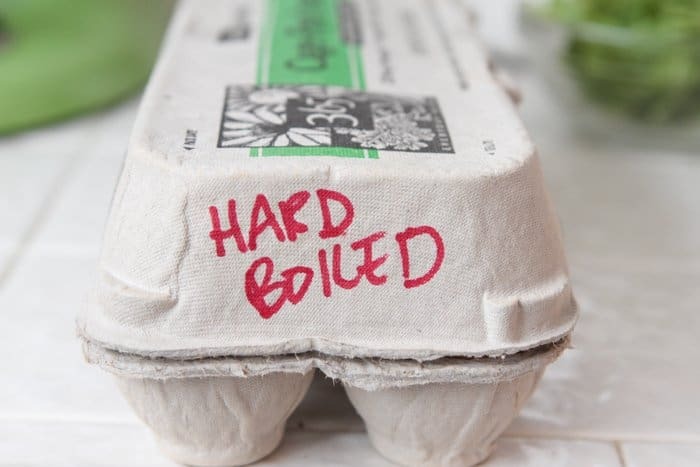 I had trouble peeling my fresh eggs until I discovered a secret. 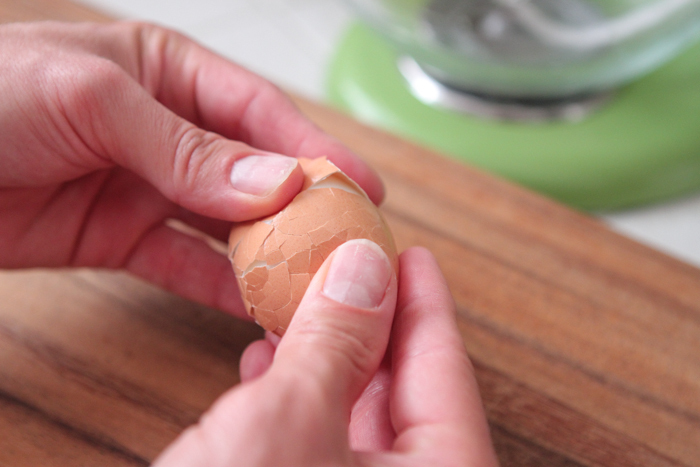 Make a little hole by Pushing a tack into the fat end of your egg and proceed as normal. 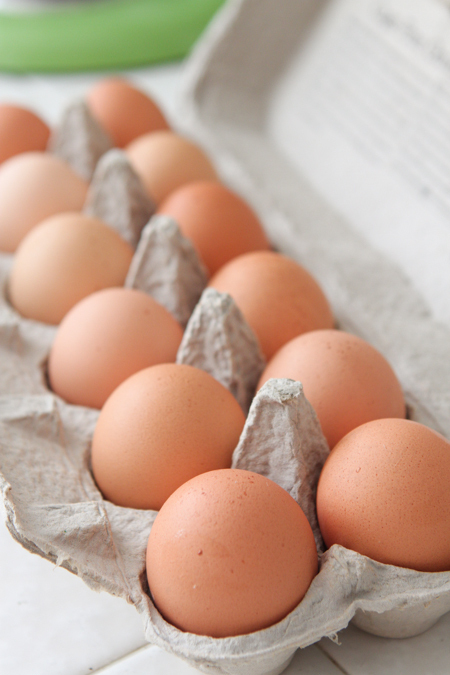 Your fresh eggs will peel like a breeze. 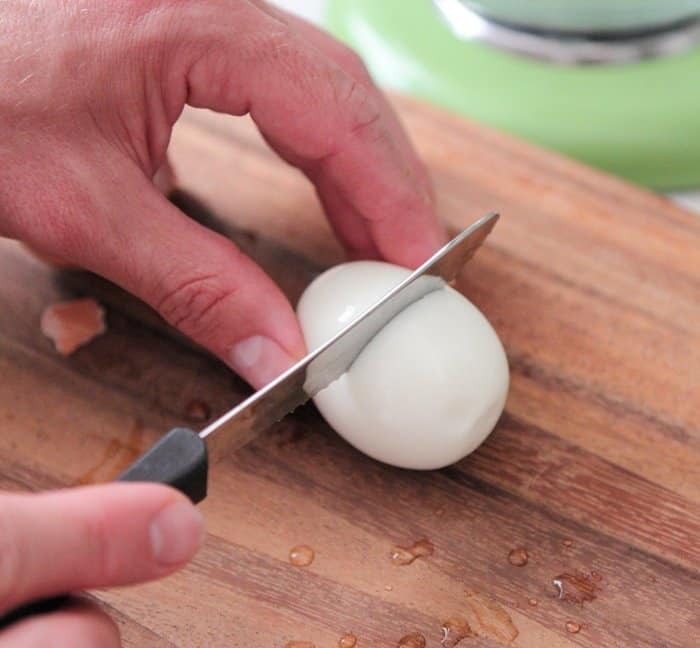 No more wasting half your fresh egg when peeling! I’ve had a hard time every now and then getting eggs to peel! I heard once that the green coating on the yolk hapens because of trapped sulphur (?) 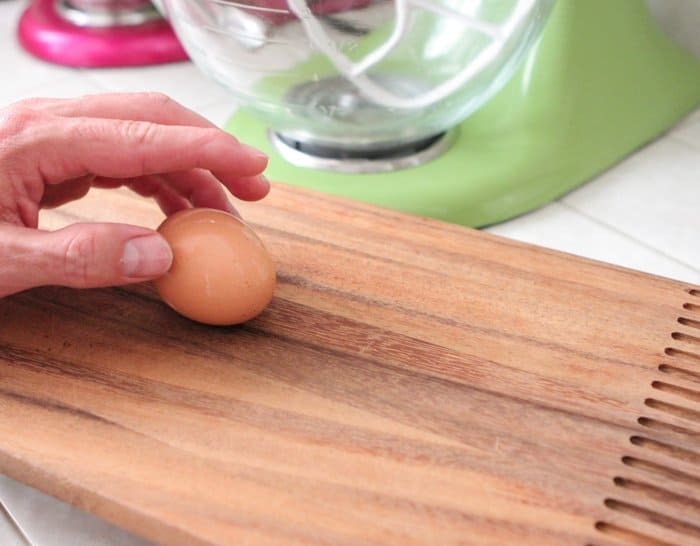 and if you slightly crack the egg as soon as you take it off the stove – if you are not going to peel it asap – the green coating does not happen. The green tint happens because the egg gets over cooked. 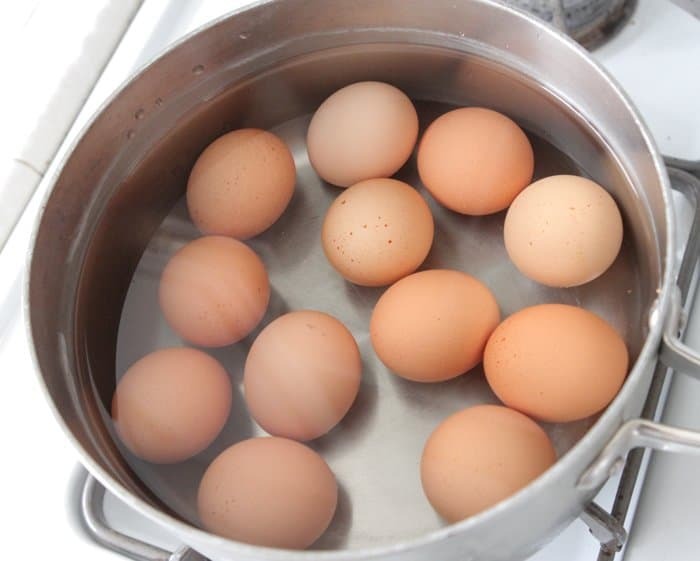 Every perfectly cooked egg has no green tint. 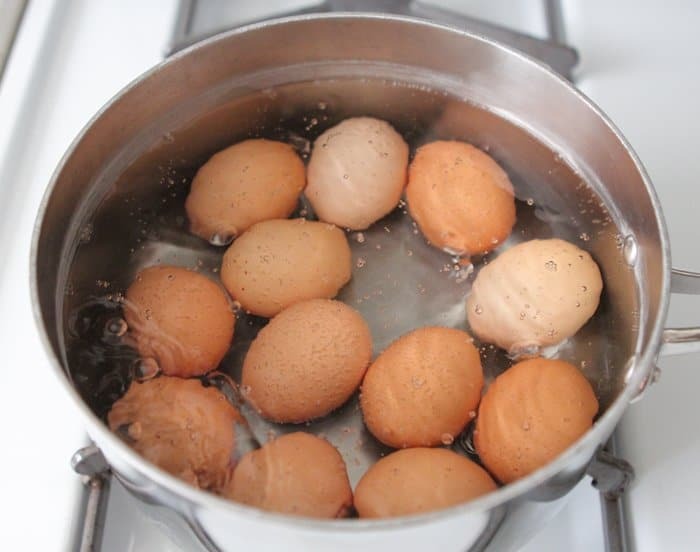 It only takes 7 minutes to boil an egg. But most people will boil it twice as long or more. 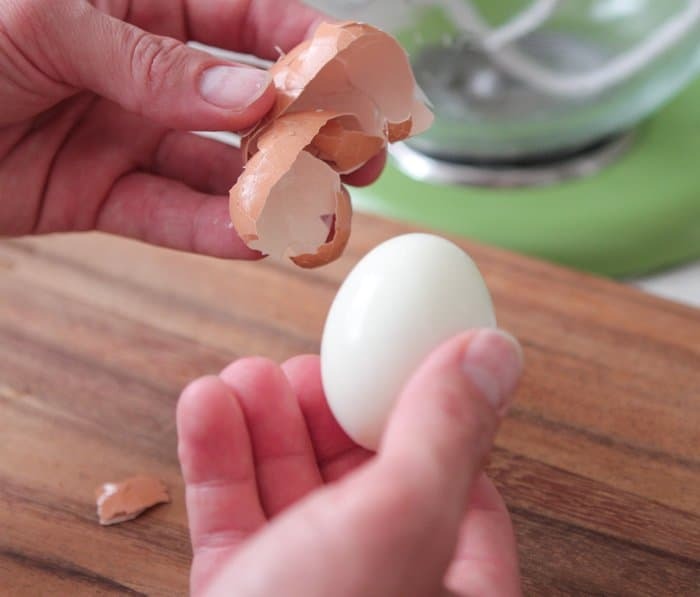 Then you’ll have green tinted around the yolk when you cut your boiled egg in half. Apparently this guys 12 minute method isn’t over cooking. The ice bath is a nice tip. I have a similar method, but I take my pot off the heat and cover it once it comes to a boil. But my eggs never peel as good as yours, so I might try keeping it on! Thanks for the terrific tutorial! Love the photos. Love the brown egg suggestion. oh my goodness thank you so much for the tutorial. It helped so much, normally when it comes down to my cooking questions i just call my mom but when it came down to the TIME to leave the eggs for them to be done she said “i just forget about them and come back to them and they are done, you just know.” umm no mom not everybody just knows..lol i tried this yesterday for dinner and they came out so pretty and perfect, thank you once again i can NOW say i KNOW how to make hard boiled eggs. Perfect eggs in one shot. Well done! I love it – we have the same labeled carton in our refrigerator! 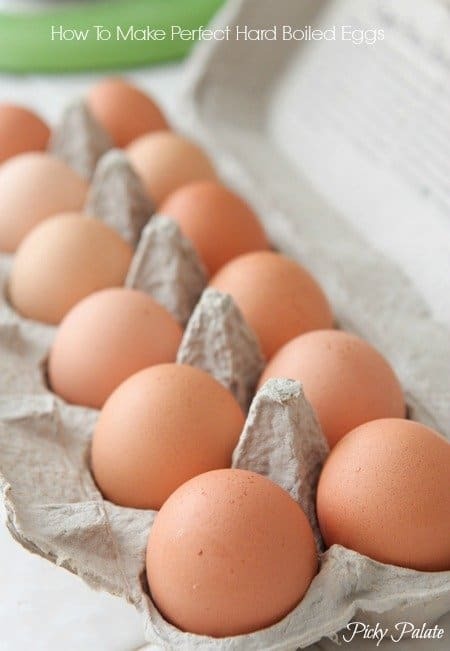 Add baking soda to your water and the eggs will be EASY to peel! I can attest to this method. 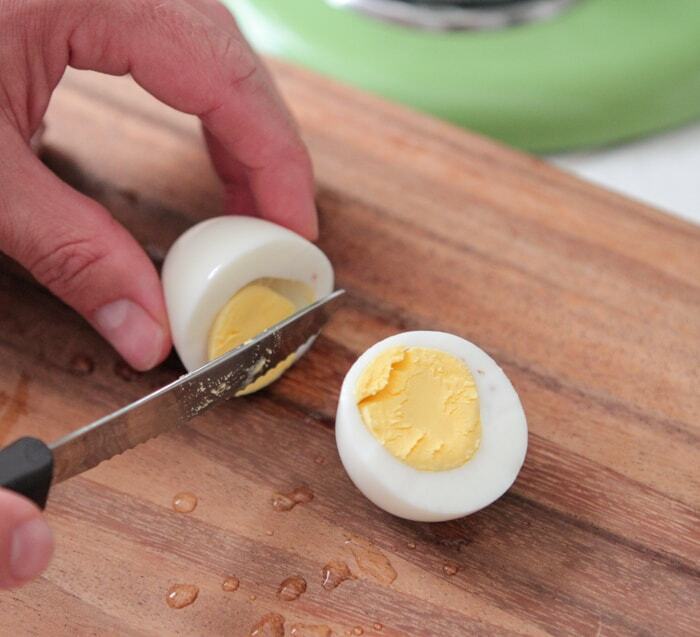 It is EXACTLY the same way I have been making perfect hard boiled eggs for years! 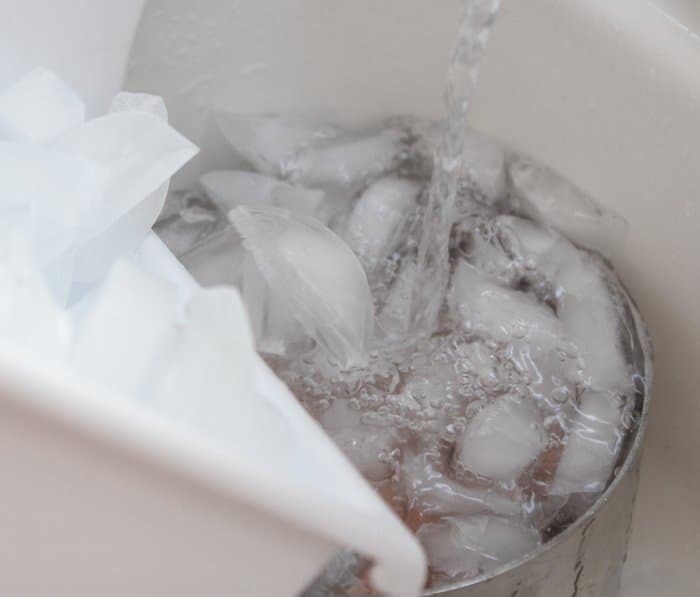 The ice bath is critical. Glad to see it in print! Exactly the way I do it. Wait did you say remove from fire & lid it? I do & set timer for 10-11 minutes. 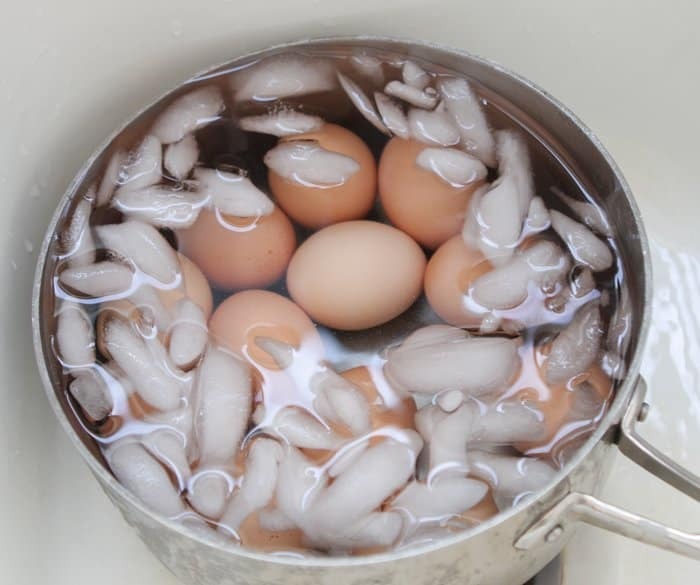 Ice is rare at my house so I usually dump off hot water & run cold water over till eggs are cooled. Darn Good Knives… Cutco is awesome. Great! So glad to hear it, thanks for the feedback! My husband’s hard boiled eggs always came out perfect. He did the same as you. This recipe is wonderful! We have a new induction stove top and my old recipe did not cook the eggs enough. This one was perfect. After boiling, I simmered the (white) eggs at 7&1/2 for 14 minutes. Then I let them cool in ice water for about 20 minutes. I am enjoying one right now in a spinach salad and it’s delicious. So glad to hear it Anne! Thanks for sharing! 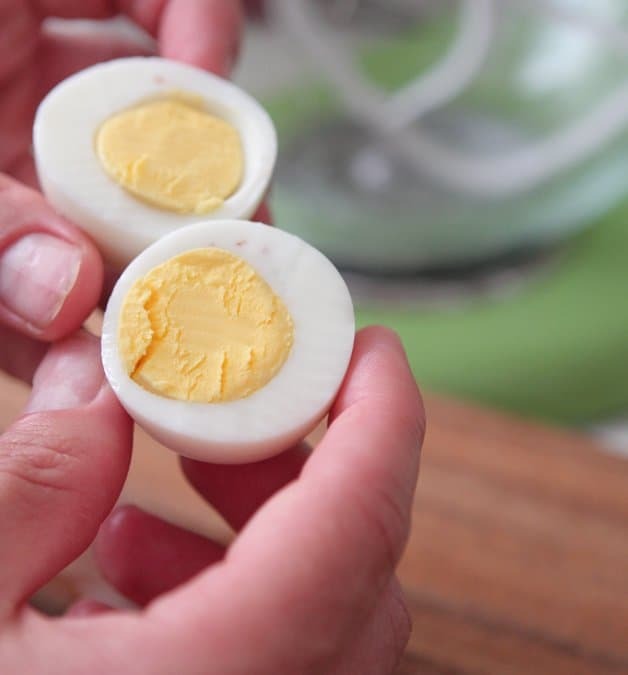 I have tried several techniques for hard boiled eggs. This is the BEST! The shell did remove easily and the yolk was a beautiful yellow. Thanks! Tried this method for our Easter Eggs. Peeled great, and cooked perfectly. Thanks! Thanks for sharing this method. I’m glad to know that fresh eggs are the reason behind a “sticky” shell. That drives me insane. 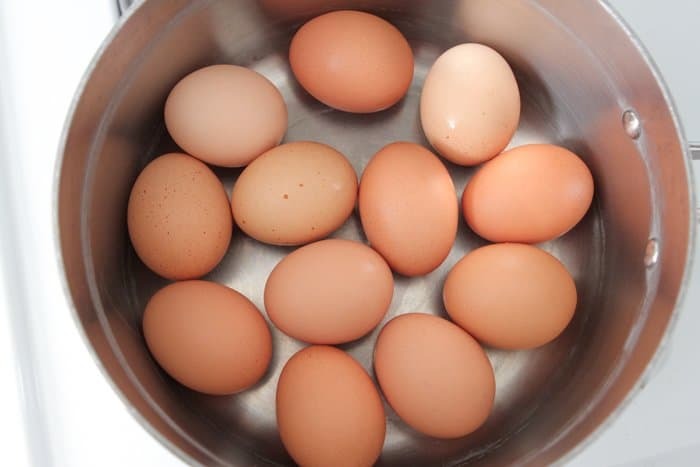 I hope you don’t mind my mentioning that storing peeled eggs in the container the raw eggs came in is not the best idea; Salmonella – a food-borne pathogen – lives on the shell of the egg. 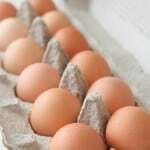 Placing peeled eggs back into the container increases your risk for Salmonella. Thanks again for the method. Off to pin it! The eggs put back in the caroom weren’t peeled! I love your stuff. It is simply amazing and makes it easy when I need something new and exciting for dinner. As for getting shells off easy. I like to put a tablespoon of baking soda in the water. Shells come right off. Followed your instructions to the letter and they were perfect. Many thanks! Now can you inclog a disposal? I just thought I’d share This. My husband did this trick and now it works every time. 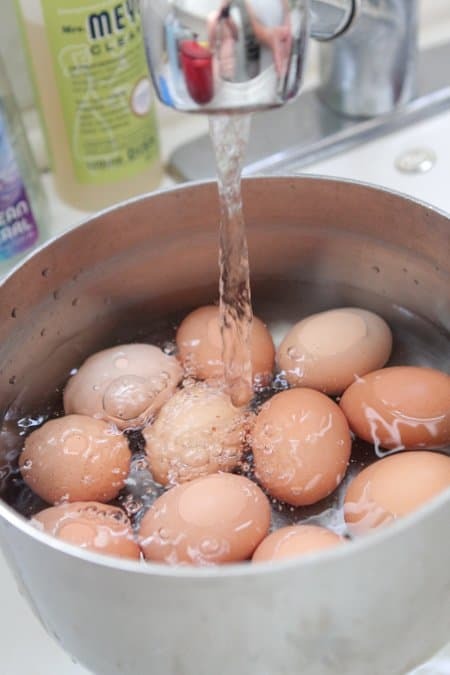 If you drop the eggs into boiling salted water they peel perfectly usually in just 2 or 3 pieces. We boil them for 16 minutes and I always stir the water 1st and use a large wooden spoon to set them down into the water. You should try it’s!